Will the fifth year be a charm for Abenomics? With the tightest labor markets in generations and stock market at 26-year highs, it’s reasonable to hope the longest expansion in 16 years will finally give workers a hefty raise in 2018. That’s certainly Prime Minister Shinzo Abe’s bet. Ditto for Bank of Japan Gov. Haruhiko Kuroda, who declared recently that Tokyo’s “powerful monetary easing has been producing remarkable effects.” Just not on the higher pay pivotal to getting households to spend more, sadly. Real wages fell 0.1 percent in September from a year ago, down a fourth straight month. Nor is 2018 looking like the charm of a year Abenomics needs, according to forecasts from Mercer. Its annual global compensation report expects Japan to come in dead last in nominal wage gains among Asian nations. 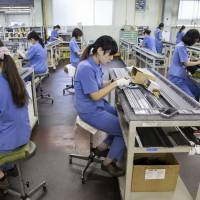 Despite a 2.8 percent unemployment, a 23-year low, Japan is seen producing an average 2 percent boost (which may be too optimistic), roughly half the amount of South Korea, Singapore and Hong Kong and one-third that of China. There are obvious problems with such comparisons, given Japan’s level of development, demographics and the breadth of deflationary forces throughout the economy. But Mercer’s reality check is a moment to wonder what lies below bullish bets on Japan for 2018. The Nikkei is a momentum story. As long as the BOJ keeps the monetary spigot open, more or less, the yen doesn’t skyrocket and the United States and China keep chugging along, corporate profits can maintain today’s momentum. Wages are something else, though, as Abenomics enters its fifth year. By now, you’d think Abe’s team would realize ultralow interest rates aren’t enough. You’d think that 46 days since winning a new electoral mandate would be enough time to unveil new structural reforms. Abe’s team continues to talk up an economy that needs bold action. This absence of urgency augurs poorly for a wage surge. The next 12 months are all about constitutional revision related to national security. Sure, markets will obsess about whether Kuroda gets a second turn as BOJ head (odds are he will). Punters will buzz about the BOJ perhaps scaling back in government bond purchases. Will Kuroda Inc. act less like a hedge fund gorging on exchange-traded funds and more like a free-market central bank? But the more important thread to follow is inflation, and how even steps Abe takes to deregulate the economy could complicate reflation. Take Japan’s notoriously rigid mobile networks. Two years ago, Abe set out to give the smartphone-crazed masses a break. Twenty-five consecutive months of lower costs are putting BOJ officials in a tough spot: glad market efficiency is improving, but bemoaning how it complicates generating 2 percent inflation. Deregulation, after all, is meant to reduce consumer prices. The real problem is that companies are sitting on more than ¥300 trillion of tax reserves they could use to fatten paycheck or invest in new industries. Why not tax excess cash? Or go the other way and offer tax breaks to executives sharing the wealth BOJ largess and the weak yen bequeathed them. Japan should raise the minimum wage again from a comically low ¥822 per hour. Abe’s team might want to urge labor organizations like the Japanese Trade Union Conference (Rengo), the nation’s biggest, to raise their sights. Its request for next year — a 2 percent base pay bump — is the same as the two previous ones. Why not shoot for 5 percent or 7 percent and split the difference? While Abe’s Liberal Democratic Party long sided with business over labor, that arrangement isn’t padding incomes. The LDP should take its Oct. 22 general election victory out for a ride and shake up labor norms. One way is to scrap seniority-based compensation and promotions, which feed an institutionalized bias toward job security. It discourages job hopping and hitting up bosses for raises. 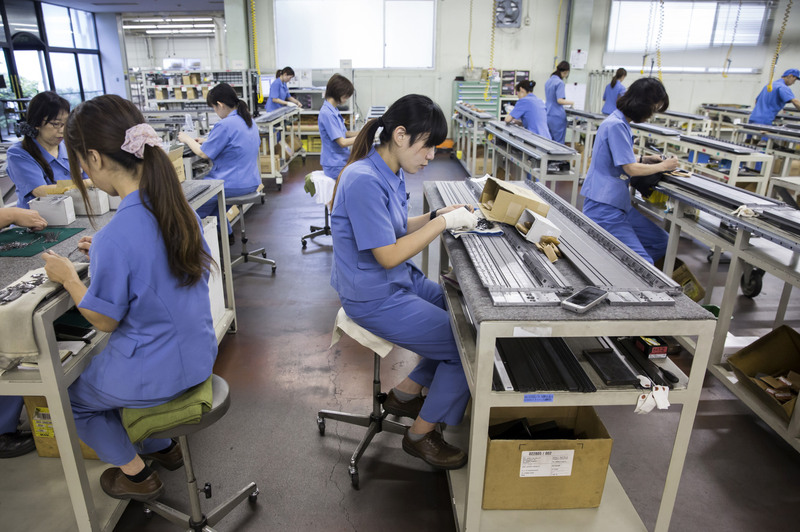 A more merit-based system wouldn’t just increase productivity and innovation — it would revolutionize wage-pricing dynamics and get the BOJ closer to the elusive 2 percent promised land. It’s time, too, to empower the other half of Japan’s population. Let’s dispense with trite talk of making women “shine” and incentivize companies to make more female staffers “regular” with equal pay, full benefits and career opportunities. Again, Japan makes for awkward comparisons with, say, the Philippines, where average 6.3 percent nominal wage gains are expected. Or Thailand (5.3 percent) or Malaysia (5.2 percent). If Tokyo wants companies to open their wallets, it must disrupt corporate Japan’s incrementalism. The key is for Abenomics is getting on with the upgrades with which it’s been flirting since 2012. In October, the availability of jobs per each job seeker was the highest in nearly 44 years. The fact Japan is dead last in Asia for wage gains proves Tokyo isn’t doing enough to use the window of opportunity afforded by today’s growth. If Abe wants to change this dynamic in 2018, the time to turn on the reformist charm is now.